There is a multitude of ways to advertise on Facebook. The Facebook documentation (click here to visit it) is rich and we know that we can easily get lost. We wanted to help you by introducing one way (among others) to create a dynamic remarketing campaign. 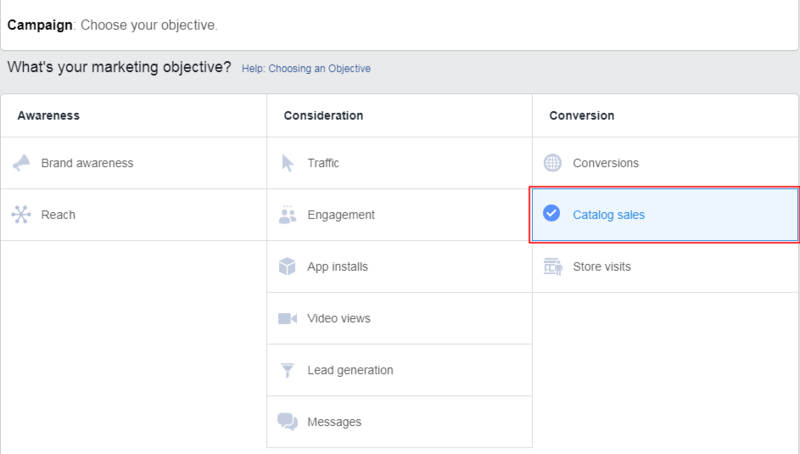 have created at least one Facebook catalog (see our FAQ). 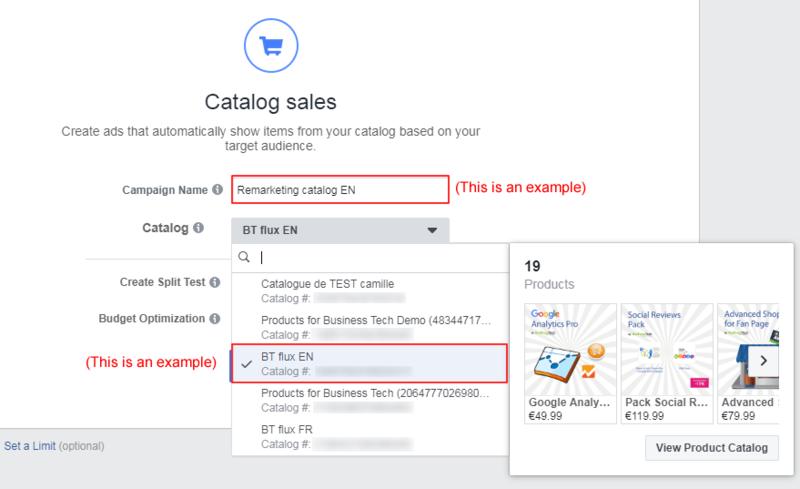 Note that you can also use the default catalog set by Facebook in your Business Manager account and in this case you do not have to create a catalog. Have created and installed the Facebook pixel on your site pages (see our FAQ). Click here to test the pixel working. You arrive on the first level of creation which concerns the definition of an advertising campaign objective. Each advertising campaign has a specific objective. The first thing to do is to define this objective. Click here to know more about the advertising objectives of Facebook campaigns. Give a name for your advertising campaign. We advise you to mention for example the catalog and the target language. In this example, we're going to create a remarketing campaign, we therefore chose to indicate it also into the campaign name. Then select the catalog on which you want to diffuse the campaign. In this example, we decided to select the catalog of EN products, but you can choose the catalog you want. Click here to know more about the "Catalog sales" objective. Click "Continue" (don't touch to "split test" and "budget optimization" options, which are advanced options, you will be able to worry about them in a second time, once you have created many advertising campaigns). You arrive on the second level of creation which concerns your first ad set creation. You can create one or several ad sets for a same campaign (then for a same objective). Enter a name for this ad set. For example, if you plan to create multiple sets of ads, each time varying the target audience, enter the target audience in the name of each set. 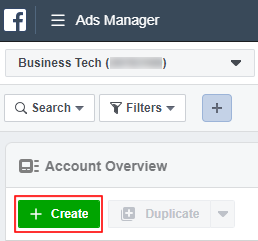 Note that you can use existing info to build the name of your ad set (to do that, click on "Advanced Options"). Choose the products of the catalog you want to promote. or select a set of products that you could have created upstream in the management of your catalog, or create a new set of products. To do this click on the "+" and configure this set of products using the proposed filters. These filters are based on the product data you sent in your data feed. 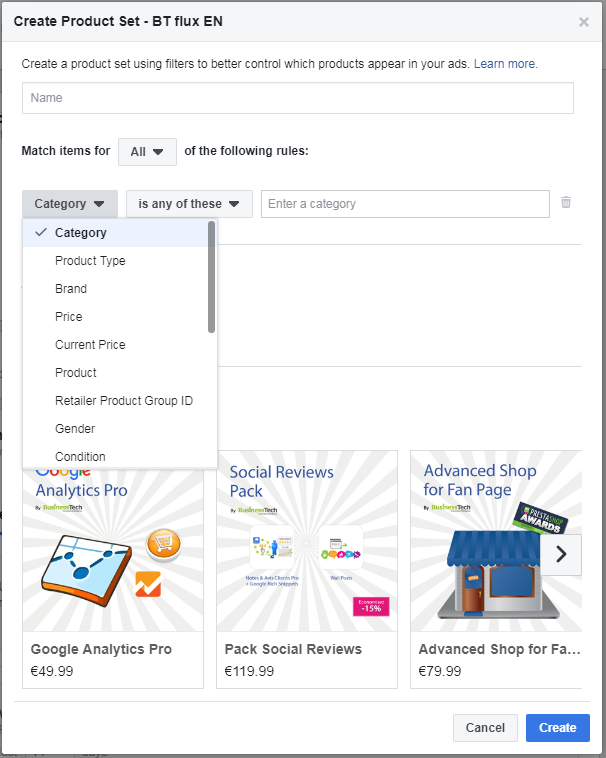 For example, you can filter products on their category, availability, brand, price, etc. Take the time to explore the many possibilities available to you. The following section allows you to define an offer people can save and get reminders about. In this example, we're not going to do one but, if you want to know more, click here. 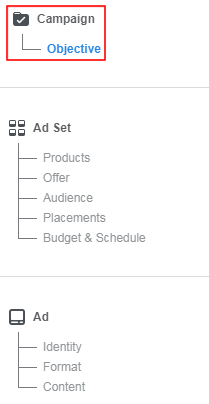 This part allows you to define who you want to display your ads to. When you choose a target audience for your ad set, you can either create a new audience, or use a previously saved audience. We're going to create a new audience. You can either use the data sent by the pixel installed on your site (what we are going to do), or create a large audience manually, using demographic data and other criteria. To know more about large targeting click here. people who added to cart products from the above selected product set but who didn't purchased them. Contrary to the previous audience, this one doesn't take into account people who just "viewed" these products. Each time you have the opportunity to set a number of days to refine or expand the audience. 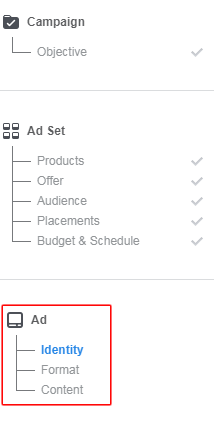 You should know that you can also select custom audiences (click here to know more on custom audiences) or make an advanced targeting thanks to advanced options (click here to know more), but for this simple example, we aren't going to take care of these options and we leave the default values. Let's go to the advertising placements. You can define the places where you want to display your ads. We advise you to leave the option on "Automatic placements" in order to maximize your budget and get a maximum efficiency of your ads. Indeed, Facebook will display them where they are likely to perform best. However, if you want to know more about advertising placements, click here. Regarding the following options, for the example we're goind to leave them as they are because we have to remain simple here. 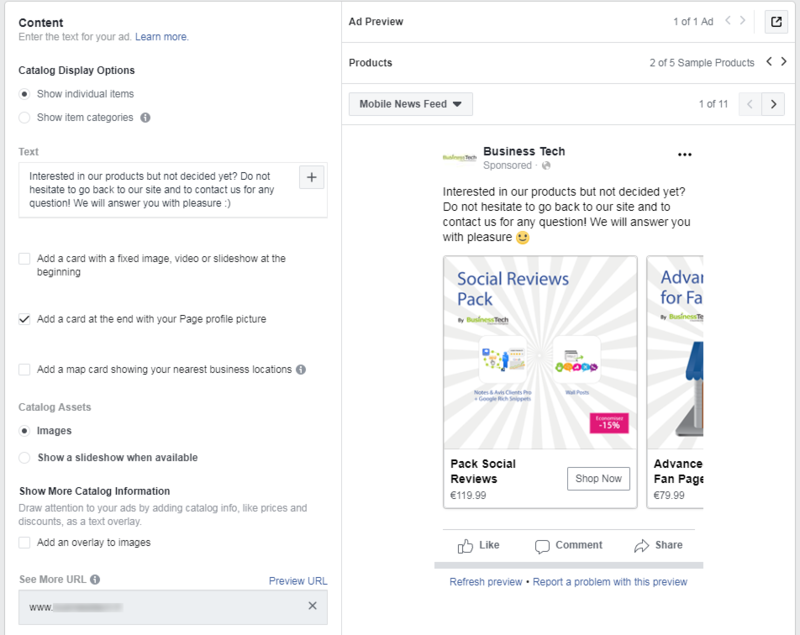 Click here to visit the Facebook documentation about the advertising budget if you want to specify your budget use. You arrive on the last step of creation which concerns the ad on its own. You have the opportunity to create one or several ads for a same ad set. Give a name to this ad. If for example you plan to create several ads, each time varying the advertising format, indicate, in the name of each ad, the format used. 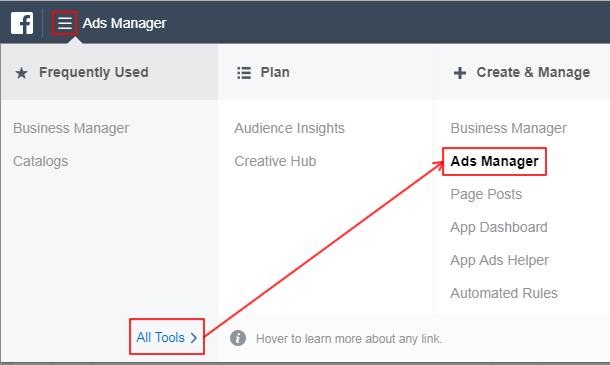 Note that you can use existing info to build the name of your ad (to do that, click "Advanced Options"). Select here among the Facebook pages you manage the one that will represent your business in this ad. Note that you can also create a page by clicking the "+". Do the same for your Instagram accounts if you have more than one. This section allows you to choose the look of your ad. The available formats vary depending on the objective of your campaign. For the "Catalog sales" objective, you can choose between a "carousel" of products, a single image or a collection (which has the advantage of offering a fullscreen view on mobile). Click here to know more on advertising formats available for dynamic ads. Note that depending on the chosen format, some options appear or desappear in the "Content" section. For example, for the carousel format, you will be able to choose to automatically rotate your product images (slideshow mode) or allow the user to manually scroll through the images. 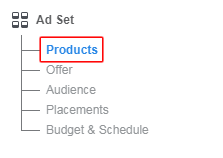 As the name suggests, this section allows you to define the content of your ad. The displayed options are adapted according to the ad format previously selected. Do not hesitate to test the various options available to you. Click here to know how to customize the creative content of a dynamic ad. Finally, click "Confirm". 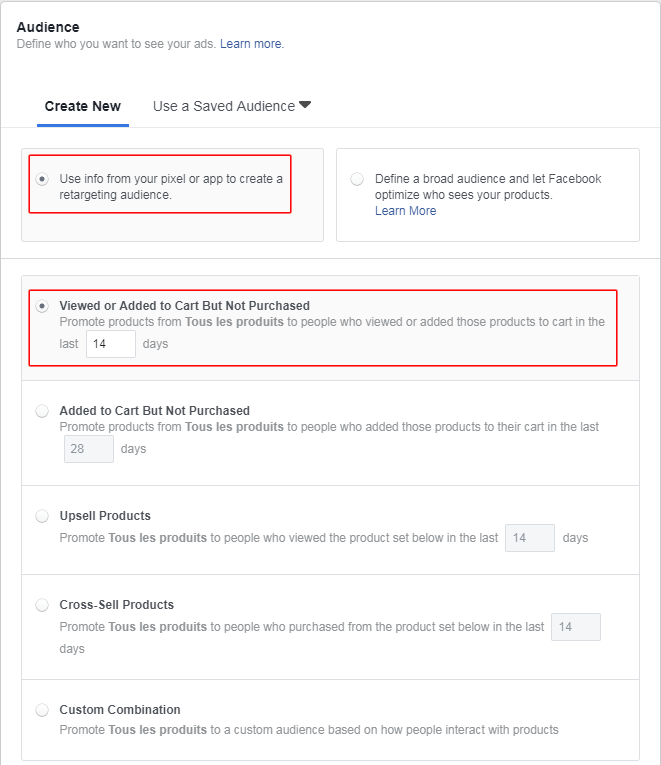 Your campaign will be reviewed by Facebook and if it's validated, it will be launched on the date you specified in the "Schedule" section. To visit the recommendations for dynamic ads click here.